Composer and performer Sumiko Sato captures the heritage sounds and cultural practices of her native area in the far northern prefecture of Iwate on the island of Honshu, Japan. 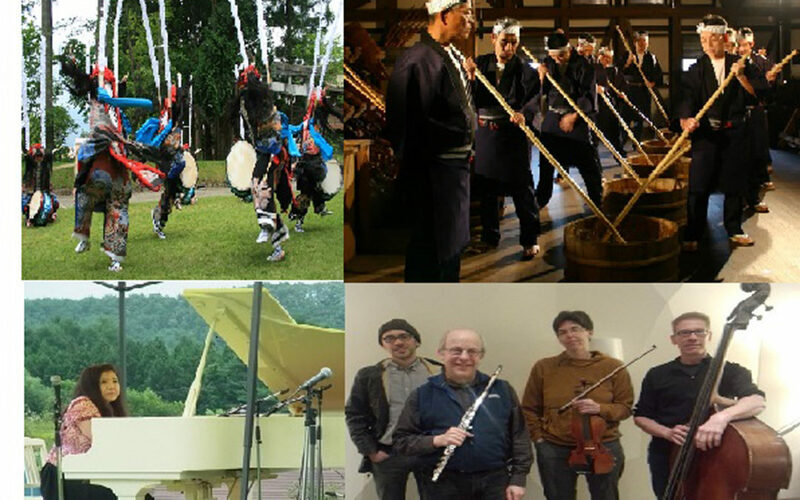 Her new compositions focusing on the Sakaya Uta (sake makers’ songs) and the ShiShi Odori (deer-hunting dance) will be presented at 8pm, Saturday, January 21, at the Chapel Performance Space in Wallingford. The concert, part of Nonsequitur’s Wayward Music Series, includes Sato on piano and Seattle musicians Paul Kikuchi on percussion, Kevin Krentz on cello, Tari Nelson-Zagar on violin, Dennis Staskowski on contrabass, and Paul Taub on flute. Sato, who now lives in Iwate Prefecture, spent nine years in Seattle pursuing her music education and completed her Doctorate in Composition at the University of Washington in 1996, citing her mentors as Ken Benshoof and Stuart Dempster. She received a residency award in 2015 from Jack Straw Productions to complete and record this work. She includes eight sake workers’ songs in her piece, and will also present videos of both the sake brewers and the ShiShi Odori to accompany the performance. Iwate Prefecture is a mecca for fine sake, Sato asserts. The Sakaya Uta, sake brewers’ traditional songs, are well known in Japan and have been performed and recorded in, and outside, Japan. They stem from the centuries-old practice of farmers leaving home to work in the sake breweries for several months during the winter. The regular beat and songs sung in unison aided in the consistency of line movements in the work brigade. The name ShiShi Odori literally translates as Lion Dance, but in the ancient shamanistic practices of Northern Japan, it referred to Deer Hunting Dance. According to musician Paul Kikuchi, who visited Iwate Prefecture, also his family’s native area, hundreds of local residents perform in the annual Deer Dance Festival in authentic costumes with tall antlers, dancing and drumming in the streets. Sato composed the ShiShi Odori this past autumn in tribute to the renowned Iwate Prefecture poet and author Kenji Miyazawa (1896-1933), whose famous story illuminated the origins of the deer dance.